This bestselling Panasonic Bread machine is outstanding in its field, and is one of a range of bread makers that the company produce. The SD-RD250 boasts 5 baking modes and 2 loaf sizes for an exceptional array of types of bread and much more. This machine is mid-range in price, it certainly isn’t the most expensive available, but wont be found in any bargain basements any time soon either. The panasonic range and this model claim to make bread making easier than ever and take the hassle out of freshly baked loaves every morning. The abilities it boasts considering its price are excellent. Large LCD display to make sure you have the easiest possible experience using your machine. The Panasonic models are brilliant for making things clear and simple, so you won’t waste your time trying to figure out how to use the features. Two sizes. Medium and XL so that you can make bread to accommodate small or large families and gatherings. Crust preference. Choose between a light and dark loaf depending on what you prefer. Five Bread Modes; Basic, French, Pasta, Pizza Dough, and Bake Only. Basic is for a lovely soft loaf either wholemeal or white, French will make you a lovely crusty loaf with a soft inside, pasta mode to prepare a pasta dough (this is a real added bonus for those of us who like to make our own pasta), Pizza dough mode (we’re getting very italian now) and a bake only mode, which means you can even use the machine for preparing birthday cakes and more baked goods. Non-stick, easy remove baking pan. Panasonic claim that their innovative design helps make their pan one of the easiest and most durable available. Their easy remove system means that the risk of burning is minimal when you grab your cooked loaf, and that it won’t scratch or break after numerous uses. No Viewing Window. The manufacturers claim that not having a viewing window is a real benefit for bread machines, as it helps with the baking process, keeping the heat in and making for a crusty finish, even color and perfectly rising loaf. Easy to clean. The non-stick pan and clever design make the process of cleaning this machine very simple and easy. Timer. One of my favorite features is the timer, which means you can set your bread to be ready any time in the next 13 hours, so you can go to work or even to bed knowing your loaf will be ready when you want it. 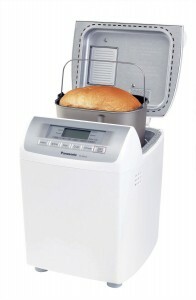 This definitely is one of the best machines featured on our bread machine review website. Excellent value for money and a wide range of great features. Panasonic are a reliable brand and this maker is no different, it’s durable and will definitely hold up to the test of time, so you’ll get your moneys worth with this piece of equipment that no kitchen should be without.